Dental caries is an important dental public health problem and is also the most prevalent oral disease among children and adults in the world. The prevalence of dental caries was of great interest for long and is a principal subject of many epidemiological researches being carried out all over the world. This significant but a preventable public health problem interferes with normal food intake, speech, self-esteem, and routine activities affecting overall health status of the children. Dental caries is a multifactorial infectious microbial disease of the teeth that results in localized dissolution and destruction of the calcified tissues often resulting in cavitation. The oral health of children 12 years old is the object of several epidemiological studies conducted around the world. According to the World Health Organization (WHO, 2013), the importance given to this age group is due to the fact that it is the age that children leave primary school. Thus, in many countries, the age of 12 years is the last age at which data can be easily obtained through a reliable sample of the school system. Moreover, it is possible that at this age, all the permanent teeth except third molars have already erupted. Thus, the age of 12 years was determined as the age of global monitoring of caries for international comparisons and monitoring of disease trends. There is a high prevalence of dental caries all around the world involving the people of all region and society. voluminous literature about exits about dental caries levels in Indian population. The current prevalence of dental caries in India is approximately 60-65 % which is increasing day by day. Geographical location plays a great role in caries prevalence; it varies with the change in location. According to the National Oral Health Survey report 2004, caries prevalence in India was 51.9%, 53.8%, and 63.1% at ages 5, 12, and 15 years in different parts of India, respectively. Of available literature from 1940 to 1960, the prevalence of dental caries in India showed a varied picture.,, In spite of conflicting reports, it has been observed that during 1940, the prevalence of dental caries in India  was 55.5%, and during 1960, it was reported to be 68.4%. Mahbubnagar district is a geographical area located in Telangana state at the border between Telangana and Karnataka. Majority of the people staying here belong to lower socioeconomic status. Telangana state has many areas which have high fluoride levels in drinking water and Mahbubnagar district is one among them where people are affected with both dental and skeletal fluorosis. No study showing the prevalence of dental caries has been carried out so far in this region; hence, a study was carried out with an aim to assess the prevalence of dental caries in 6–12-year-old school-going children of different regions of Mahbubnagar district. The objectives of the study were to know the prevalence of dental caries in both primary and permanent dentition according to different age groups of children and also to suggest suitable preventive programs for the prevention of dental caries in this population. The sampling procedure involved multistage stratified sampling  where whole Mahbubnagar district is divided into 5 strata, namely, Mahbubnagar Central, Southern, Northern, Eastern, and Western. In each stratum, following areas were selected. Mahbubnagar Western part: Kosgi, Narayanpet, Bommaraspet, Makthal. In each area, one school was selected by simple random sampling (lottery) method and on the whole about twenty schools were selected from above-mentioned areas. Eligible children were selected randomly from a list obtained from school records. Age eligibility requires that the children fall into the appropriate age at the time of sampling. Mahbubnagar district is spread over 18,432 km 2, located at 498 m altitude with a population of 4,042,191. It contains about 4 revenue divisions, 64 mandals, 1541 villages, 4 municipalities, and 4689 schools of which 3133 were primary schools, 889 were upper primary schools, 658 were high schools, and 9 were higher secondary schools. A pilot study was carried out on 100 children, aged 6–12 years from one government and one public school to determine the feasibility of the study; depending on the prevalence obtained, 95% confidence level, and 5% allowable error, the sample size was determined to be 2000. Data collection instrument included number of data types and different data collection instruments. It consisted of retrospective data collection and concurrent data. During the examination of schoolchildren, a questionnaire was used to fill out personal data such as name, age, gender, occupation, income status of the parent, permanent address, oral hygiene methods, and diet chart. The draft of the questionnaire was reviewed by the panel of experts which included faculty members from pedodontics and preventive dentistry, public health dentistry, school teachers, head masters, and then finalized. 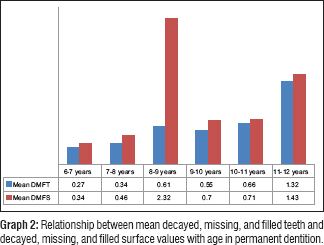 Dental caries was diagnosed using the decayed, missing, and filled teeth (DMFT)/dmft Index (WHO; 1997). The inclusion and exclusion criteria were as follows. The tooth was considered carious (d component) if there was visible evidence of a cavity, including untreated dental caries. The missing (m component) included teeth with indications for extractions or teeth extracted due to caries. The filled (f component) included filled teeth. Children with systemic diseases and on antibiotic therapy in the previous 6 months were excluded from the study. Clinical examination (ADA Type III) for dental caries was done according to dentition status using mouth mirror and community periodontal index probe. Standard infection control guidelines were applied. All the recordings were carried out in the daylight, and the child was made to sit in ordinary chair facing away from a direct sunlight. Before starting the study, ethical clearance was taken from the Ethical Committee of Institution, Mahbubnagar. An official permission was obtained from the district educational officer of Mahbubnagar. Informed consent was obtained from the respective school headmasters and parents of the children. The examination was done by three dentists; they were assisted by three dental assistants over a period of 1 year for recording data. All six persons were trained prior and recording procedure was standardized by repeated sections of calibration between the examiner and chief supervisor in the Department of Pedodontics and Preventive Dentistry, in the institution, Mahbubnagar, before starting the actual recording on children. Before the commencement of the study, training and intraexaminer calibration was done by the staff of the Department of Pedodontics and Preventive Dentistry in the school premises (κ =90%). All data were entered into an SPSS (18) program (IBM corporation, Chicago, USA); both descriptive and analytic approaches were used in the data analysis. The association between prevalence of caries and gender was tested using the Chi-square test. The t-test was used to test the mean dmft and decayed, missing, and filled surface (dmfs) difference between groups. P< 0.05 was considered statistically significant. [Table 1] shows the age group of the population ranges from 6 to 12 years with mean age of 10.5 years. Among a total population of 2000 children, 332 belong to the age group of 6–7 years, 236 belong to the age group of 8–9 years, 286 belong to the age group of 9–10 years, and 327 belong to the age group of 11–12 years. Of the population, 1021 are males and 979 are females. P value is 0.003 (<0.05), which is statistically significant. [Table 2] shows the Mahbubnagar district distributed in to 5 regions namely Central, Eastern, Western and Northern from each region 400 sample were selected. 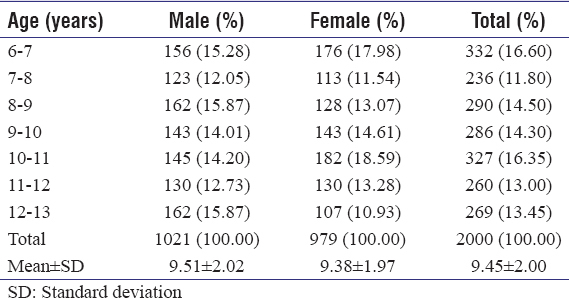 The [Table 3] indicates that from one to other age group the caries prevalence is dissimilar. The total caries prevalence in primary dentition, in males is 63.6%, in females is 65.1%. The caries free percentage in males is 36.4% and females is 34.8%. The total caries percentage in all gender is 64.2%. The caries prevalence in permanent dentition in males is 26.2% in females is 73.5%. The total caries prevalence in both males and females is 26.6%. The total caries-free prevalence in both males and females is 73.5%. From one to other age group, the caries prevalence rate is dissimilar; it is statistically significant (P = 0.000, which is P< 0.01). The overall decayed, extracted, and filled teeth (deft) value for both males and females was 1.49 ± 1.56 and decayed, extracted, and filled surface value was 1.9% ±2.65%. The differences between males and females are statically not significant. The total numbers of males mean deft values are 1.51 ± 1.57; the mean deft values are 1.47 ± 1.54 [Graph 1]. The overall Mean DMFFT and DMFS values for both males and females were 0.57 ± 1.235, 0.65 ± 1.47. The difference between males &females were statistically significant. The total mean DMFT values in males are 0.610 ± 1.50, in females are 0.57 ± 1.28 [Graph 2]. [Table 4] indicates that higher deft values (1.49, 64.2%) were found in daily labor due to increased exposure of teeth to poor oral hygiene conditions. [Table 5] indicates that the mean DMFT was found 0.57 (26.6%). This [Table 6]: Indicates it is statistically significant with all age group. Except 8-9 years. The total mean for both males and females is 1.60 ± 1.50. The total mean values for sugar exposures in males are 1.50 ± 0.82, the total mean values for sugar exposure in females are1.70 ± 0.84. Many studies ,,, have been conducted to identify the prevalence of caries in different parts of India. However, there have been relatively very few data reported in literature concerning the prevalence of dental caries among Mahbubnagar district children, particularly in mixed dentition period, so the present study was conducted in schoolchildren of 6–12 years. In the present study, the prevalence of dental caries was higher in primary dentition (mean deft 1.49, 64.2%) when compared to permanent dentition (mean DMFT 0.57, 26.6%). 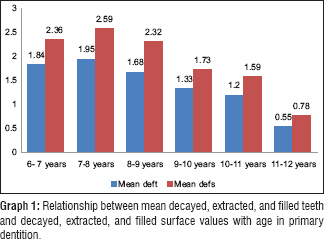 In the present study, higher dmft was found in the age group of 7–8 years; this could be explained on the basis of increased exposure of the teeth to poor oral hygiene conditions in comparison to that of the age group of 6–7 years, but DMFT was lesser in the age group of 11–12 years due to the presence of newly erupted permanent teeth. Similarly, the trend was reported by Sudha et al. In the present study, a low caries experience was seen in 12 years age group when compared to 6 years age group. Similar findings, i.e., caries decrease from 6 to 12 years age group, have been reported by many studies.,,,, Dash et al. observed a pattern in which carries was increasing from 5 to 8 years and subsequently decreased at 11 and 15 years. A study by Grewal et al. reported that child population exhibited caries prevalence of more than 60% until the age of 11 years and showed a decline to 36% at the age of 12 years. Retnakumari  reported in her study that there was no increase in prevalence of caries as age increases (prevalence at 6 years was 67.5% and at 12 years 67.2%). However, some authors have also reported increased caries incidence with an increase in age., The reason behind this is high caries in 5 years could be that thickness of enamel in the deciduous teeth is less than that of permanent teeth being 1 mm and 2.5 mm, respectively. Thinner enamel layer combined with a set of other factors, such as a diet higher in sugars and/or the inability of a younger child to properly brush their teeth on their own, cumulates the effect. Lower calcium content of deciduous teeth and structural differences , may increase caries susceptibility in deciduous teeth  along with lack of preventive measures. Another reason could be that the WHO index does not record incipient caries but records only when the caries involves dentin, resulting in slight underestimation of caries in 12-year age group. In the present study, in the permanent dentition, 11–12-year-old children had more caries (mean DMFT 1.32, mean DMFS 1.43). Moreover, less caries was found in age group of 6–7 years (mean dmft 0.27, mean dmfs 0.34). The reason behind this is the presence of less number of permanent teeth at the age group of 6–7 years when compared to age group of 11–12 years. In the present study, the prevalence of dental caries was high in the low socioeconomic status because of their poor oral hygiene practice, lack of awareness, improper food intake, and family status. This finding is similar to the study conducted by Moses et al., Recent studies from Europe demonstrate a significant inverse association between social class and oral health status in young children. The North Brisbane study supports these findings by confirming that preschool children from a lower socioeconomic background also more active decay and more missing teeth from previous disease compared with children from higher socioeconomic status levels. The strongest correlation between sugar consumption and caries development was seen when international data are compared. In a study by Sreebny, data on sugar supplied in various countries and data on caries prevalence obtained from WHO for 6-year-old children in 23 nations and 12-year-old children in 47 nations showed that the availability of <50 g sugar/persons/day in a country was always associated with dmft or DMFT scores of <3. Similar findings were reported by Gustafsson et al., Winter et al., and Shetty and Tandon. However, McDonald found no significant relationship between sugar consumption and caries prevalence. In this study, a highly significant relation was found between sugar consumption and socioeconomic status. Similar findings were reported by Blinkhorn et al. who stated that in deposited areas, mothers were more likely to give continuous sugar to children throughout that day, increasing the daily sugar consumption. In the present study it was seen that the prevalence of dental caries in children has been found to be 64.2%. Similar observation was made in Vidarbha region in central India was found to be 65.70%. However, a cross-sectional study conducted in Bundelkhand region, of India, reported a much higher prevalence of dental caries (82.62%) in 3–14 years age group when compared to the present study. The prevalence of caries in our study was higher in boys than girls. Similar findings were reported by Moses et al. and Joshi et al., The increased prevalence of caries in the boys may be due to the marked preference for the sons, which manifest in preferential feeding compared to daughters and due to snacking habit among boys during the longer outside stay. The present study reported the mean DMFT/dmft of 3.2 which is much higher than the WHO (oral health goals 2010) target of mean DMFT/dmft of 1.5. The high mean DMFT/dmft reported could be the reflection of low economic status in rural region of Mahbubnagar district. Our data show a high prevalence of dental caries among 7–8-year-old schoolchildren from low socioeconomic status background in both urban and rural areas of Mahbubnagar district. These data may be of importance in the evaluation of the past and planning of future oral health prevention and treatment programs targeting young children in primary schools. A comprehensive community-focused oral health-care intervention that includes oral health education in elementary schools and homes is recommended to increase general oral health awareness. As this study is cross-sectional, it measures cause and effect at the same point in time, introducing the problem of temporal ambiguity and inability in establishing a causal relationship. Risk factors for dental caries, socioeconomic status, and oral hygiene behaviors should be assessed along with the prevalence of dental caries. Primaray oral health care system should be strengthen in this region. Bhatia HP, Srivastava B, Khatri S, Aggarwal A, Singh AK, Gupta N. Prevalence of dental caries among 3-15 old school children in Ghaziabad city and its adjoining areas – A correlated survey. J Oral Health Community Dent 2012;6:135-9. Sharma V, Gupta N, Arora V, Gupta P, Mehta N. Caries experience in permanent dentition among 11-14 year's old school children in Panchkula district (Haryana) India. Int J Sci Study 2015;3:112-5. Casanova-Rosado AJ, Medina-Solís CE, Casanova-Rosado JF, Vallejos-Sánchez AA, Maupomé G, Avila-Burgos L. Dental caries and associated factors in Mexican schoolchildren aged 6-13 years. Acta Odontol Scand 2005;63:245-51. Basha S, Swamy HS. Dental caries experience, tooth surface distribution and associated factors in 6- and 13- year- old school children from Davangere, India. J Clin Exp Dent 2012;4:e210-6. Al-Darwish M, El Ansari W, Bener A. Prevalence of dental caries among 12-14 year old children in Qatar. Saudi Dent J 2014;26:115-25.
WHO. Oral Health Surveys: Basic Methods. 5th ed. Geneva: World Health Organization; 2013. p. 125. Karunakaran R, Somasundaram S, Gawthaman M, Vinodh S, Manikandan S, Gokulnathan S. Prevalence of dental caries among school-going children in Namakkal district: A cross-sectional study. J Pharm Bioallied Sci 2014;6 Suppl 1:S160-1. Joshi N, Sujan S, Joshi K, Parekh H, Dave B. Prevalence, severity and related factors of dental caries in school going children of Vadodara city – An epidemiological study. J Int Oral Health 2013;5:35-9. National Oral Health Care Program Implentation Strategies DGHS. Ministry of Health & Family Welfare-Government of India; 2004;29:3. Damle SC, Patel AR. Caries prevalence and treatment need amongst children of Dharavi, Bombay, India. Community Dent Oral Epidemiol 1994;22:62-3. Antia FE. The dental caries experience of school going children in the city of Bombay. JIDA1962;39-325. Shourie KL. Dental caries in Indian children. Indian J Med Res 1941;29:709-21. Joshi N, Rajesh R, Sunitha M. Prevalence of dental caries among school children in Kulasekharam village: A correlated prevalence survey. J Indian Soc Pedod Prev Dent 2005;23:138-40. Sudhir KM, Prashant GM, Subba Reddy VV, Mohandas U, Chandu GN. Prevalence and severity of dental fluorosis among 13- to 15-year-old school children of an area known for endemic fluorosis: Nalgonda district of Andhra Pradesh. J Indian Soc Pedod Prev Dent 2009;27:190-6. Government of India, Ministry of MSME. Hyderabad: Micro, Small Enterprises; 2011. p.1-21. WHO. Oral Health Survey, Basic Methods. 4th ed. Geneva: WHO; 1997. Sudha P, Bhasin S, Anegundi RT. Prevalence of dental caries among 5-13-year-old children of Mangalore city. J Indian Soc Pedod Prev Dent 2005;23:74-9. Das UM, Beena JP, Azher U. Oral health status of 6- and 12-year-old school going children in Bangalore city: An epidemiological study. J Indian Soc Pedod Prev Dent 2009;27:6-8. Saravanan S, Anuradha KP, Bhaskar DJ. Prevalence of dental caries and treatment needs among school going children of Pondicherry, India. J Indian Soc Pedod Prev Dent 2003;21:1-12. Sahoo PK, Tewari A, Chawla HS, Sachdev V. Intercomparison of prevalence and severity of dental caries using two recording systems. J Indian Soc Pedod Prev Dent 1991;8:1-11. Zusman SP, Natapov H. Caries prevalence in Ashkelon children in 1994. ASDC J Dent Child 1997;64:359-61. Dash JK, Sahoo PK, Bhuyan SK, Sahoo SK. Prevalence of dental caries and treatment needs among children of Cuttack (Orissa). J Indian Soc Pedod Prev Dent 2002;20:139-43. Retnakumari N. Prevalence of dental caries and risk assessment among primary school children of 6-12 years in the Varkala municipal area of Kerala. J Indian Soc Pedod Prev Dent 1999;17:135-42. Rodrigues JS, Damle SG. Prevalence of dental caries and treatment need in 12-15 year old municipal school children of Mumbai. J Indian Soc Pedod Prev Dent 1998;16:31-6. Kulkami SS, Deshpande SD. Caries prevalence and treatment needs in 11-15 year old children of Belgaum city. J Indian Soc Pedod Prev Dent 2002;20:12-5. Mejia GC, Ha DH. Dental caries trends in Australian school children. Aust Dent J 2011;56:227-30. Dukic W, Delija B, Lulic Dukic O. Caries prevalence among schoolchildren in Zagreb, Croatia. Croat Med J 2011;52:665-71. Moses J, Rangeeth BN, Gurunathan D. Prevalence of dental caries, socio-economic status and treatment needs among 5 to 15 year old school going children of Chidambaram. J Clin Diagn Res 2011;5:146-51. Winter GB, Rule DC, Mailer GP, James PM, Gordon PH. The prevalence of dental caries in pre-school children aged 1 to 4 years. Br Dent J 1971;130:434-6. Shetty NS, Tandon S. Prevalence of dental caries as related to risk factors in schoolchildren of South Kanara. J Indian Soc Pedod Prev Dent 1988;6:30-7. Blinkhorn AS, Downer MC, Wight C. Dental caries experience among Scottish secondary school children in relation to dental care. Br Dent J 1983;154:327-30. Kalaskar RR, Kalaskar AR, Chandorikar H, Haz-Arey S. Prevalence of dental caries and treatment needs in school going children of Vidarbha region, central India. Univ Res J Dent 2015;5:68-72. Jain A, Jain V, Suri SM, Jain RK. Prevalence of dental caries in male children from 3 to 14 years of age of Bundelkhand region, India. Int J Community Med Public Health 2016;3:787-90. Perera PJ, Abeyweera NT, Fernando MP, Warnakulasuriya TD, Ranathunga N. Prevalence of dental caries among a cohort of preschool children living in Gampaha district, Sri Lanka: A descriptive cross sectional study. BMC Oral Health 2012;12-49.